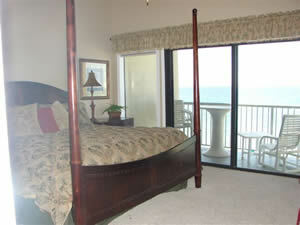 Ideal beach vacation rental for families with kids because you fall out of bed onto the beach. Unbeatable romantic master bedroom for mom and dad, upstairs. Fantastic kitchen and outdoor grill if you don't want restaurants every night. 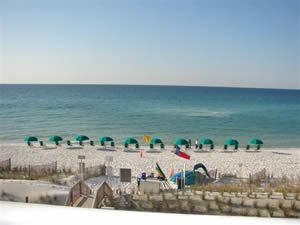 Right in Destin, so there are a million things to do if the weather acts up. Great locations for golf, fishing and shopping. Within driving distance of 10 states, so you can bring your own car. Fly to Oklaloosa airport on Continental Airlines and rent a car. Right on the beach. No road between balcony and sand. Sun comes up out of the water and sets into the water. Other Information about the sleeping facilities: An oversized chair has a pull-out single bed, bringing total to 7. Other Information about the kitchen/dining facilities: Kitchen has granite counter tops, solid wood cabinets and stainless steel appliances. Other information about the other living space: Two stories. 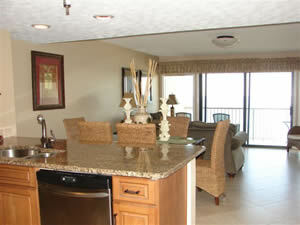 Upper level has master bedroom/bath with balcony and vaulted ceilings overlooking white sand and emerald green water. Lower level has family room overlooking the same. Footsteps from the beach, makes it great for families with kids and easy to run back and forth from the beach. Other information about the parking facilities: Covered parking under the building. One spot for sure, maybe room for more. 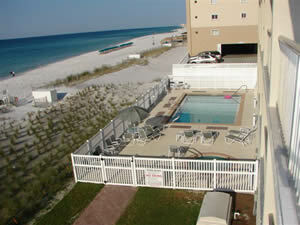 Other amenities not listed above: Walking distance to restaurants, Junes Dunes park and Henderson State Park. Other information about pets: No dogs on beach. Other activities/entertainment: Destin is famous for sweaky white powder sand, emerald green water, fishing, golf, restaurants and shopping. Other Information about the property: Owned by brother of ESPN Baseball Tonight TV analyst Tim Kurkjian. Rent this unit and, if you request, I will send you a signed copy of his latest book "Is This A Great Game or What". You have to ask me. 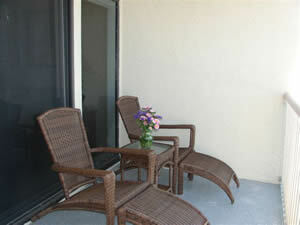 Summer rate $1981/week, with peak rate of $2121/week for late June to mid July. Fall rate is $1148/week, spring rate is $1598/week and winter rate is only $1519/month for snowbirds.